Death is one of those things in life that is certain. It's a topic most people avoid. When someone close to us dies it "sobers" us and reminds us of our own mortality. I was recently reminded of my mortality when I purchased a box of Whoppers® at a local convenience store. As I poured them into my hand, one fell between my legs and onto the car seat. I finished off the last chocolatey Whopper® and went after the one that foolishly thought it had eluded my pulverizing molars. Before popping it in my mouth, I checked it for car lint... And what I found horrified me. The Whopper® had a small hole in it. When I squeezed it gently, it started to collapse. I put it back in the carton, stunned. I had discovered the corpse of a malted milk ball. I knew what had to be done: An autopsy. I did a U-turn in the middle of the road and sped to the local sheriff's office. It amazes me the apathy that our law enforcement has nowadays. He wouldn't even give me the home phone number of the coroner! The sheriff offered his condolences and said I could keep the corpse and dispose of it as I saw fit. I wasn't about to bury this poor malted milk ball with so many questions left unanswered. I suspected foul play from the beginning. Now I'm just a simple man, and I don't know anything about forensics, but I've watched plenty of episodes of Quincy and Unwrapped. So I took the autopsy into my own hands. 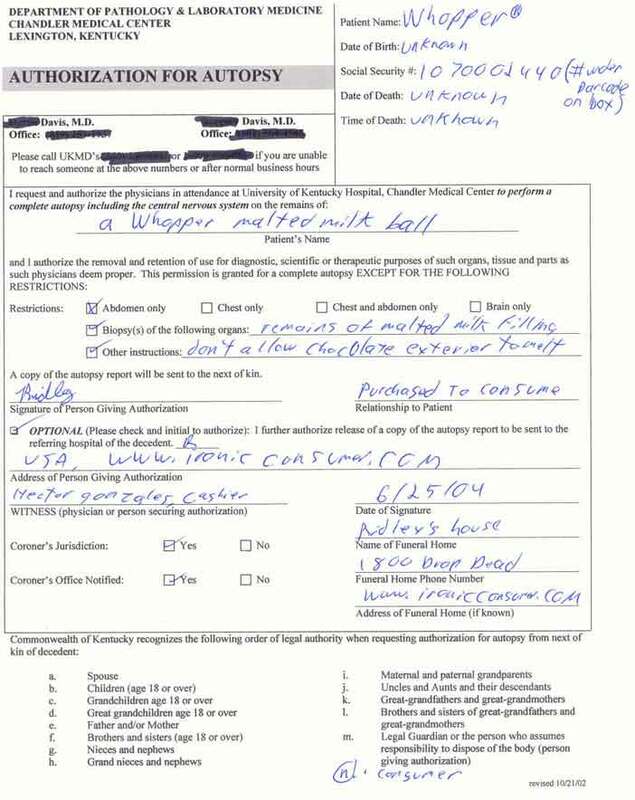 First I would need to get an authorization done, so I printed out the following form and filled it out. You can click on it and and see the red tape I had to go through. What could have caused this hole? 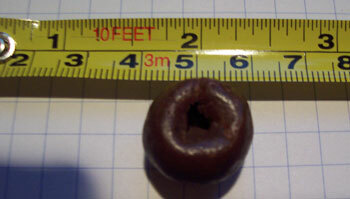 The fact that the area around the hole is concave, provides foundation for the theory that this hole was created from something pressing on the Whopper®, stabbing it if you will. 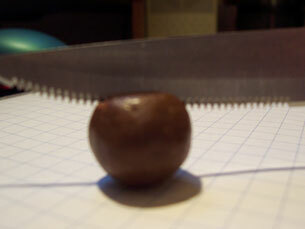 I decide to make my first incision and split the cranium of the Whopper® in half. First, I had to prepare myself before I started hacking away. I needed some of the cream under my nose just like they do on TV when they are going to perform an autopsy. I didn't have any, so I used some yogurt. I figured any white gooey stuff would do. After scrubbing up, I got a Ginsu® knife and made the first incision. What I saw next made me immediately run to the bathroom, fall to my knees, hang my head over the toilet and wish I even felt like throwing up! 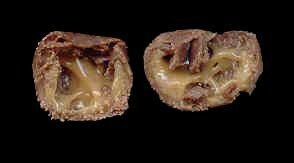 I've never seen the inside of a Whopper® look so horrifying, so monstrous, so indescribably disgusting in my entire malted milk ball munching life. 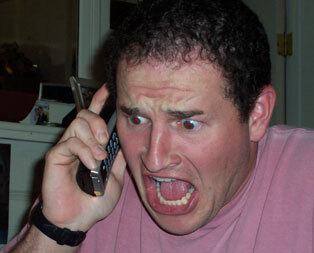 The following is a reenactment of my reaction to what I saw. The inside of this once decadent morsel of goodness was transformed from firm, crunchy malted milk, to a gooey, sticky caramel-type substance. What substance could do this? What sort of monster punctures the outside surface of something, and turns the insides to goo? EUREKA! 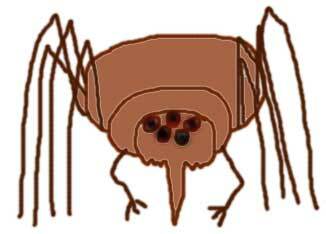 A spider! There must be some sort of spider that lives on malted milk! I quickly called a local entomologist and told him of my discovery. He was so excited he dropped the phone and it landed right in the cradle! You know how those guys get when a new species is discovered. On the back of the Whoppers® box was an 800 number. I called them to inform them of the atrocities that will befall more Whoppers® unless this newfound menace can be stopped. I recorded the conversation because I wanted to log every step of this remarkable discovery. Click on the picture below to listen to the recording. As you could see, the lady at Hershey's® couldn't see the imminent danger every little malted milk ball was in unless we find these things and stop them! If anyone out there comes across this spider, PLEASE email me! I'll even consider splitting the millions of dollars I'll be getting from books, movies, seminars, etc. Since the entomologist never called me back, I decided to create an artist's rendering of the spider, according to the wound on the Whopper®.